This relative study is done using RRG Graph from Market Analyst 7. Here RRG Graph is used to study the movements of Sectors relative to CNX Nifty Index to identify under-performing and outperforming sectors (shorter term) relative to the index. 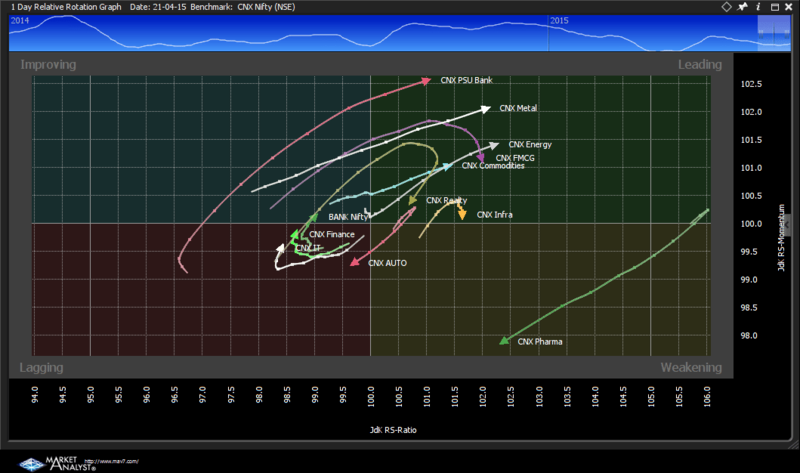 CNX PSU Bank, CNX Metal, CNX Energy, CNX Commodities are some of the sectors which shows increased momentum and currently in the leading quadrant with respect to CNX Nifty. Currently these sectors are outperforming nifty. CNX Pharma shows a very strong falling momentum in the weakening quadrant and CNX auto too with falling momentum entering from weakening to lagging quandrant. CNX Infra and CNX Realty in the leading quandrant due to its falling momentum once should avoid investing in the sector in the short run as there is a possible relative underperformance with respect to Nifty. CNX IT, CNX Finance and Bank Nifty are showing increased momentum and in the zone of migrating from lagging to improving quadrant which shows signs of possible outperformance relative to CNX Nifty in the shorter run.